DC Icons is fading into the sunset, but they are going out with a bang for their (maybe) last release. The Superman Doomsday 2 Pack is a box set that relives the epic moment that Superman died at the hands of the unstoppable force Doomsday in the comics. The set features Doomsday in his final form, and Superman in his tattered costume along with a slew of awesome accessories. You get a rocky base and individual rocks so you can recreate the iconic last scene, the shredded cape on a stick pops into that base too, also molded to match the epic cover. Superman gets 2 blast effects – a heat vision ray that attaches to his eyes and a punch effect. Doomsday has a smaller shredded cape that fits onto his spiked knuckles also recreating pages from the comic. It’s all wrapped up in an inner box that gives you a mini diorama of the street in front of the Daily Planet where the final battle took place. All in all it’s a superbly done set, the figures, accessories and box all hit the right notes. If these are indeed the last DC Icons figures, it’s a good way to go out. Read on to check out some additional thoughts and almost 100 HD shots including the epic battle between Superman and Doomsday! It is in stock now and shipping from site sponsor Entertainment Earth. DC Icons is winding down, slow fading out as we wait for DC Essentials to kick off next year. Part of these (most likely) final waves are re-releases of Rebirth Batman and Superman which originally dropped in the 7 pack earlier in the year. Last month we got Rebirth Damian and Jon Kent, the Super Sons, so getting fans their dads in single packs was a good move. Batman gets beefed up this go around, much taller and bulkier than the first DC Icons Batman was. He stands toe to toe with S.H. Figuarts style Batmen, putting him closer to a “small 6 inch” scale. All in all it’s a sharp piece, and can easily slide into a Bat-shelf without looking out of place. Let’s take a closer look after the break courtesy of Entertainment Earth! Related Entertainment Earth Links: DC Icons Rebirth Batman, DC Icons Super Sons 2 Pack, DC Icons Supergirl,DC Icons Death of Superman 2 Pack. DC Icons is coming to an end with the arrival of DC Essentials next year, but we still have some before that happens! Select figures from the later waves that never released are dropping at the end of 2017, and one of those is the Super Sons 2 pack. This features Rebirth versions of Damian Wayne and Jon Kent in the small-ish 6 inch scale, meaning they are more like 4 inches or so. Each come with additional hands, Damian has hands with batarangs, along with a staff weapon. Jon has a clear riser so he can hover behind Damian. The sculpts and paint are fantastic overall. Read on to check out some additional thoughts courtesy of Entertainment Earth! Related Entertainment Earth Links: DC Icons Super Sons 2 Pack, DC Icons Supergirl, DC Icons Rebirth Batman, DC Icons Death of Superman 2 Pack. DC Icons lives on! Wave 5’s Wonder Woman, Swamp Thing, and Deathstroke are now out, with the carry over of Static from Wave 4, along with Deluxe Cyborg. Waves don’t really count here, as they get put out individually and staggered, but this is the 5th “Round” of standard releases. This wave of figures refocuses the line a bit with varied sculpt, well executed paint and meaningful accessories. We’ve shot them all in detail, so read on for some additional thoughts and 150 HD images! 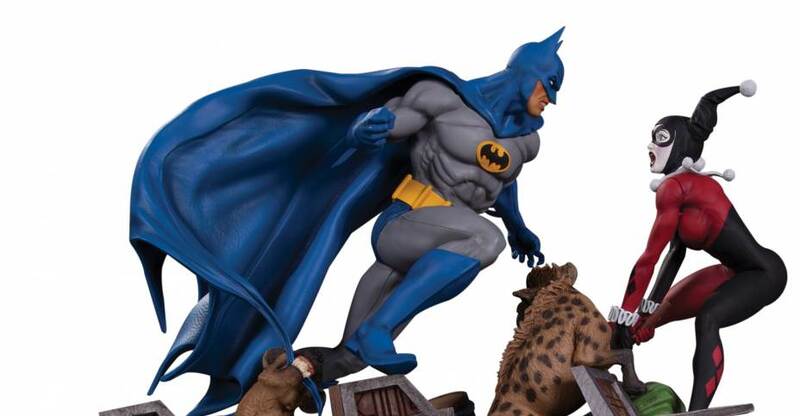 The full July DC Comics solicitations have been revealed, with a bunch of new DC Collectibles listed for release later this Fall. These include more Justice League Statues, DC Icons Figures, Bombshells, Prop Replicas and more. Check out the full list below. Read on for all of the photos and more details on each release. See photos and full details after the jump. The DC Comics Icons Accessory Pack #1 dropped late last year and is a way to add some additional weapons and accessories to your existing DC Icons line up. The set features items for Green Arrow, Harley Quinn & Joker, the Green Lanterns Hal Jordan and John Stewart, Batman and the Flash. Nothing here was absolutely necessary or missing from the original releases, but they do add some additional flare and display options. Check out over 40 images after the break! ICYMI: Check all our DC Icons Galleries here! We continue our DC Icons Galleries today with the Batgirl and Bike deluxe pack! This is the first vehicle offering into the Icons line with Batgirl’s bike and stand. The set comes from the Batgirl of Burnside run in the comics which was praised for the new direction by some but was a tad offputting to long-time Barbra Gordan fans. Batgirl’s suit is the star here, not sexualized yet still feminine, it’s a great new take on a modern female super-hero. In figure form the bike and it’s stand is stellar. Let’s take a closer look after the break courtesy of Big Bad Toy Store! Related BBTS Links: DC Comics Icons Darkseid & Grail, DC Comics Icons Burnside Batgirl & Bike, DC Comics Icons Accessory Pack 1, All DC Comics Icons (Pre-Orders). We’re catching up on our DC Icons Galleries starting today with the Darkseid and Grail 2 pack! This is the first over-sized offering into the Icons line with 12 inch Darkseid towering over the standard 5.75/6 inch figures. The set comes from the end of the New 52 era and the Darkseid War story arc in Justice League and related books. Fitting since Darkseid set off the New 52 era in Justice League #1 and was the catalyst for the Justice League forming in the first place (in that new timeline). This time he comes with his daughter Grail, who is half Amazonian to boot. You’ll have to read the books to catch up on all that, it’s a long story. Both are great in action figure form, so let’s take a look after the break courtesy of Big Bad Toy Store!